"Puedo concebir algunos escenarios clínicos en los que la marihuana se usa como un reemplazo para altas dosis de opioides. Por ejemplo, podría tener sentido que la marihuana medicinal se use en pacientes que ya toman opioides y corren un mayor riesgo de sufrir daños relacionados con estas sustancias"
"I can concieve of some clinical scenarios in which marijuana is used as a replacement for high-dose opioids. For instance, it might make sense for medical marijuana to be used in patients already on opioids and at increased risk for opioi-related harm"
She continues "This does not mean that I believe marijuana is the solution to the opioid epidemic... For patients with cancaer pain already on high-dose opioids who are at imminent risk for adverse consequences related to those opioids - such as patients with increased pain due to opioids, also known as opioid-induced hyperalgesia; patients at increased risk for accidental overdose, including patients being co-prescribed benzodiazepines; patients with obstructive sleep apnea; patients with prior history of opioid overdose; or patients with past or current opioid addiction - marijuana represents a possible harm-reduction strategy." "Replacing opioids with marijuana in this limited clinical setting might reduce the risk for death as it is difficult, if not impossible, to overdose on marijuana. 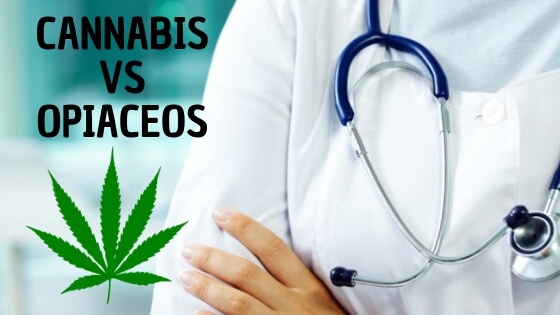 I have had patients under my care on dangerously high doses of opioids for pain who have successfully transitioned off of opioids by switching to marijuana, and who are doing better as a result. I have also had patients who attempted the same, and ended up on both opioids and marijuana with no clinical benefit..."
"I might also add that medical marijuana in place of opioids is a potential harm-reduction strategy for prescribers, who are increasingly medicolegally liable for continuing patients on high-dose opioids."